On the trail in Encampment. The site of one of the West’s most dramatic boom-and-bust stories – Encampment, Wyoming – is now a sleepy little town with a wealth of hiking and history for the traveller to enjoy. On the eastern flank of the Sierra Madre Mountains, which straddle the Continental Divide as it crosses from Wyoming into Colorado, Encampment provides an off-the-beaten-path destination, perfect for solitude and hiking. Encampment and its neighbor, Riverside, sit between two non-contiguous sections of the Medicine Bow-Routt National Forest in south-central Wyoming. To the north, about 16 miles along Wyoming 130, is Saratoga, which sits along the North Platte River and is home to several hot springs. To the northeast of Encampment is the Snowy Range. Just outside of Encampment along Wyoming 70 about one mile, a sign directs the visitor to the Encampment River Trailhead by taking a left onto U.S. Forest Service Road 3407. After passing the lush Wirz and Oldman ranches, the left fork in the road leads to a small, quiet U.S. Bureau of Land Management campground, nestled on the banks of the Encampment River and shaded by tall cottonwoods, the summer air filled with the low screeches of dive-bombing hummingbirds. At the end of a parking lot in the campground, across a sturdy bridge, is the trailhead of the Encampment River Trial, beginning its 15.9-mile journey up the river through BLM land, national forest and into the Encampment River Wilderness. The trail terminates at Commissary Park on the Wyoming-Colorado line. Beginning at 7,800 feet, the trail gains 1,100 feet in elevation. This first 6 miles of this moderate trail is home to plenty of vocal birds, including colorful western tanagers. Skittish jackrabbits criss-crossed the trail. The solitude of this area and soothing cadence of the river make for a welcome getaway. 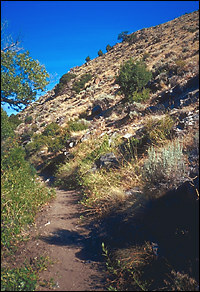 The trail begins by cutting into a steep slope peppered with sage and juniper. The first few miles of the trail pass through low mountains, bald except for the profuse and hardy sagebrush and pungent juniper. The opposite bank of the river is home to a few dozen private cabins, shaded by cottonwoods with a lush carpet of green grass beneath. About 2 miles into the trail, a submerged concrete structure is all that’s left of the Pipeline Dam, a legacy of the area’s mining days and the overly ambitious plans of the pioneers who combed through the area seeking mineral wealth. Just a quick correction. To get to the trailhead at the Odd Fellows Campground you said to turn on U.S. Forest Service Road 3407. It’s actually County Road 353 which then turns into BLM 405.